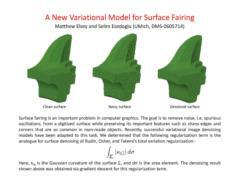 Elsey, M.; Esedoglu, S. Analogue of the total variation denoising model in the context of geometry processing.SIAM J. Multiscale Modeling and Simulation. 7:4 (2009), pp. 1549-1573.